To say that Farnoosh Torabi has accomplished a few things since I last saw her would be an understatement. Back in the spring of 2008, we asked Torabi ’02 to host a New York City roundtable of economic experts—all Penn Staters—for a story on the economic crisis for the magazine. I don’t think I’ve had occasion to talk to her since then. But about that “since then”: Let’s just say she’s been busy. She’s written three books, earned the Alumni Association’s Alumni Achievement Award, gotten married, had a kid, launched a podcast (So Money, named the No. 1 podcast of 2015), appeared on the Today show a bunch of times, and formed her own enterprise: Farnoosh Inc. You may have seen our short profile of her in our Sept./Oct. 2015 issue. Today she spoke at the Penn State Forum luncheon, offering some advice and humor from her most recent book: When She Makes More: 10 Rules for Breadwinning Women. There’s a lot of evidence, Torabi says, that a woman who makes more money than her husband can face tough challenges: Couples in which the woman is the breadwinner have a 50 percent higher divorce rate, and the husband is five times more likely to cheat, to name just two statistics. Not to mention the frustration and resentment the woman might feel—or the judgmental comments from her family or friends. 1. Level the playing field. He might not contribute as much to the family financially as you do, but give his money meaning: In her own marriage, for example, it’s her husband’s money that goes to the college savings fund for their son. 3. “Buy yourself a wife.” Torabi cited data that showed that women who make more money than their husbands also do more housework. She devotes a whole chapter in her book to outsourcing housework—cleaning, laundry, even preparing meals. She also told of how her own husband doesn’t like anyone else to do his laundry, for fear his clothes will shrink. “As a result,” she said, “every couple of weeks there will be T-shirts air-drying everywhere around the house”—which drives her crazy. Eventually she told him, “I need to know when this is going to happen, so I can plan to not be here,” drawing a laugh from the audience. —Make a list of things that would make your life better. Then ask, “What are the resources, the people, the tools, the adjustments” that would make some of that possible? —She has what she calls the Three-Bucket Rule: A couple should have three different bank accounts: “yours, mine, and ours.” When she counsels couples who are having conflict, she says, she inevitably discovers that they have only one account—a shared one. “Then, when you want a haircut,” she says, “you have to talk about it. And if you want to get highlights done, is that OK?”—again drawing laughs from the crowd. —Asked what advice she would give college-age youths if teaching a course on financial literacy, she said she’d stress the value of investing. Opening a Roth IRA as soon as you get your first job, even if it’s in high school, she said, is one example of an action that can serve you well for a lifetime. —The Internet, she said, is offering new ways for people to make money. She cited RelayRides.com, which allows you to rent out your car when you’re not using it, and TaskRabbit.com, through which you can make money doing short-term projects (such as household tasks) for others. 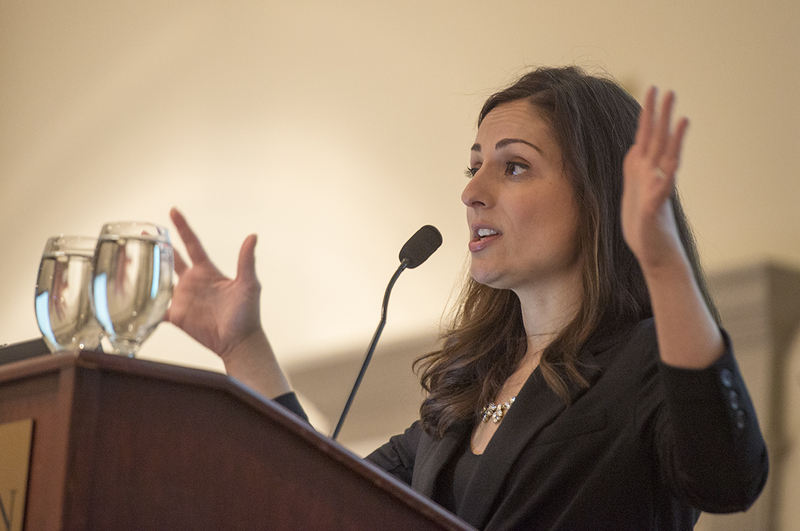 You can see more of Farnoosh’s advice at her website. Entry filed under: The Penn Stater Magazine. Tags: Farnoosh Torabi, personal finance, So Money, When She Makes More: 10 Rules for Breadwinning Women.